After a two years of collecting parts I finally have my outdoor booth set up ready to go. It’s officially June, and I have two outdoor fests under my belt with one more before the month closes out. Atlanta is not shy when it comes to hosting festivals, the latest addition is the Mac n’ Cheese fest, often with multiple festivals per weekend come spring and fall. This makes weekend planning difficult, but it allows me to have a variety of options when choosing which festivals to apply to and participate in. 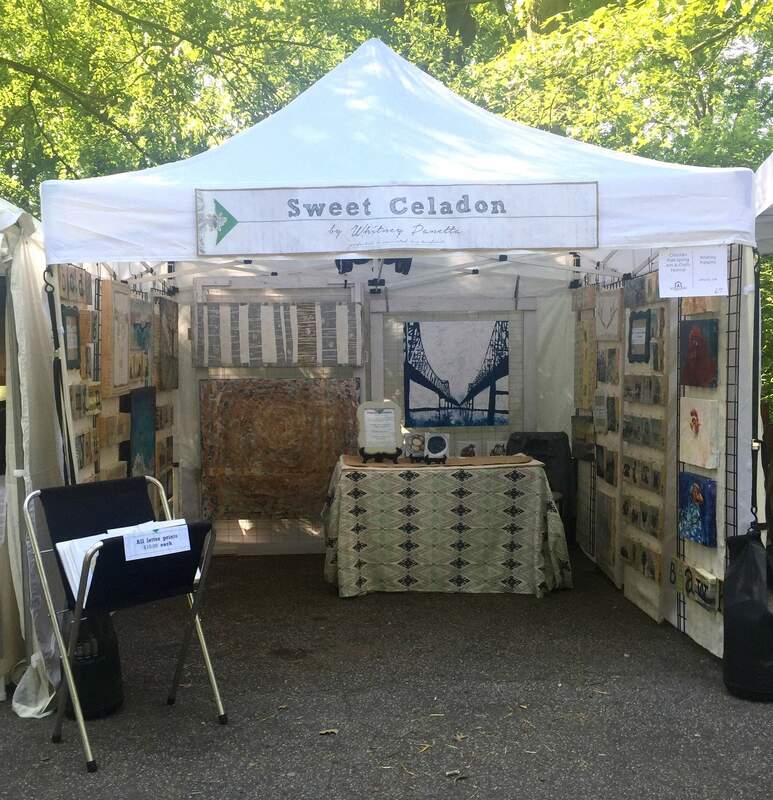 Chastain Park Arts Festival was my introduction into the outdoor festival circuit. 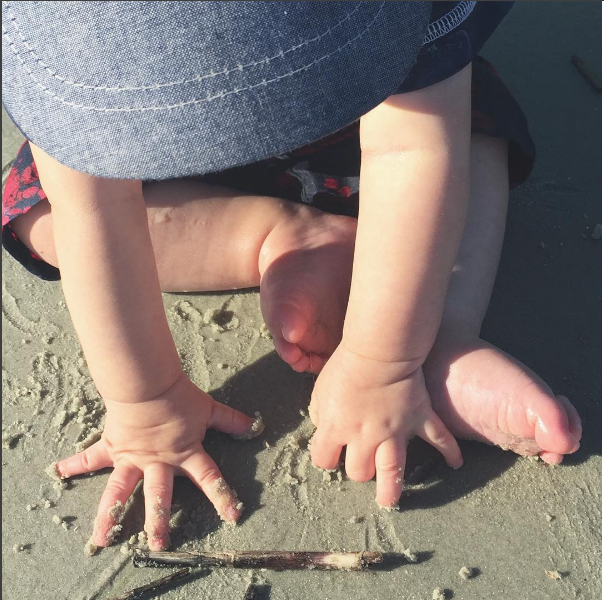 The weekend couldn’t have brought more perfect weather. It was low eighties, a light breeze, and a good continuous crowd. 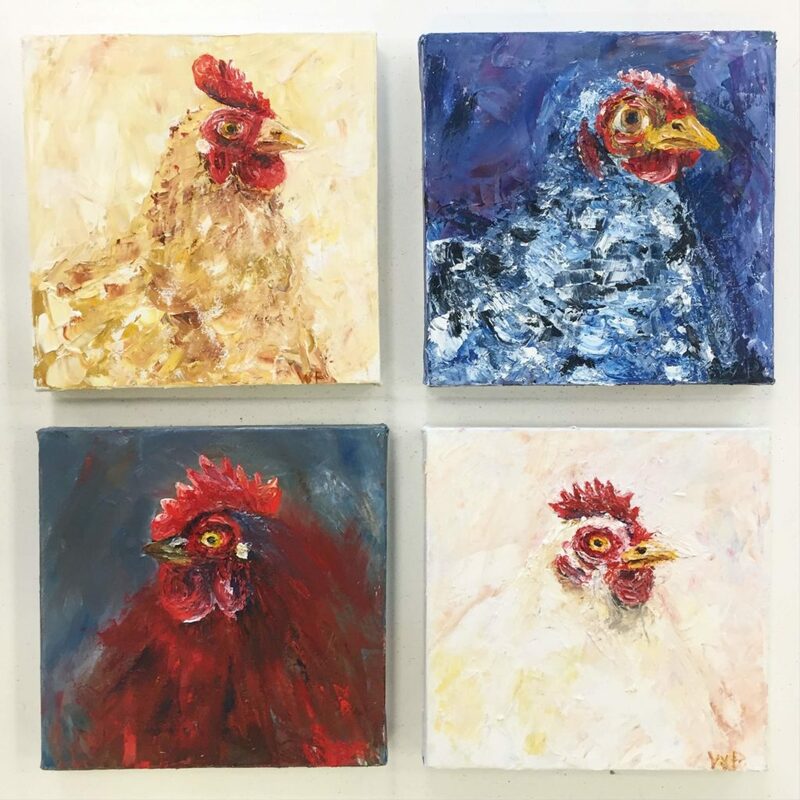 I was pleased with my profit earnings and the connections I made in the Atlanta art community. Joining the festival circuit doesn’t just mean I have another venue to sell my art. It also means I get plugged into the art community. I have a much greater opportunity to meet likeminded and goal oriented people. 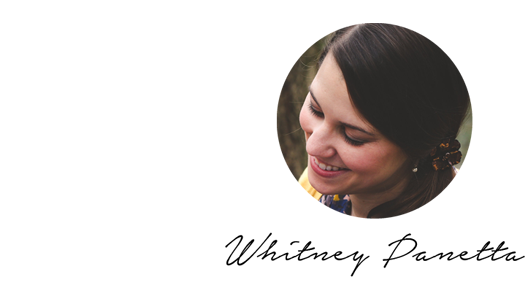 I have the chance to build relationships, learn more about my craft, and be inspired by others. I love feeling like I am finally part of the community I have observed from the outside in for so many years. Virginia Highlands Summerfest came next with an even better weekend, better foot traffic, much hotter days and a lesson in rain. I learned to place my oil paintings at the front of my booth, to save my encaustics from the direct sunlight (and potential melting) that inevitably pours in. I learned that if there is a chance of rain everything that sits on the ground should be placed on a raised surface. The later was a difficult lesson to learn when I opened my tent the next morning to deep puddles and a bag of ruined mats and prints. Next up is Old Fourth Ward Park Arts Festival in just a week and a half. 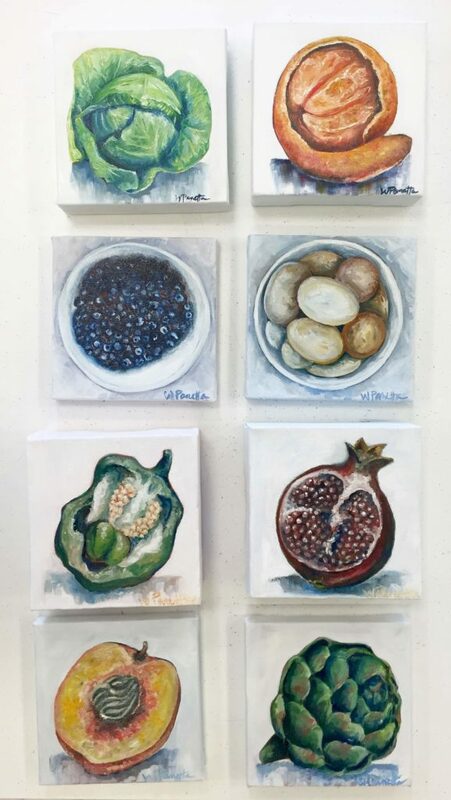 In between spending time with my family on Hilton Head Island, I am ordering new mats and prints, gluing paper to panels, and painting a new batch of fruit and veggies. I can’t wait to see what comes from this next festival and the break afterwards until my schedule fills up for the fall. Check out more about my new oil paintings below! 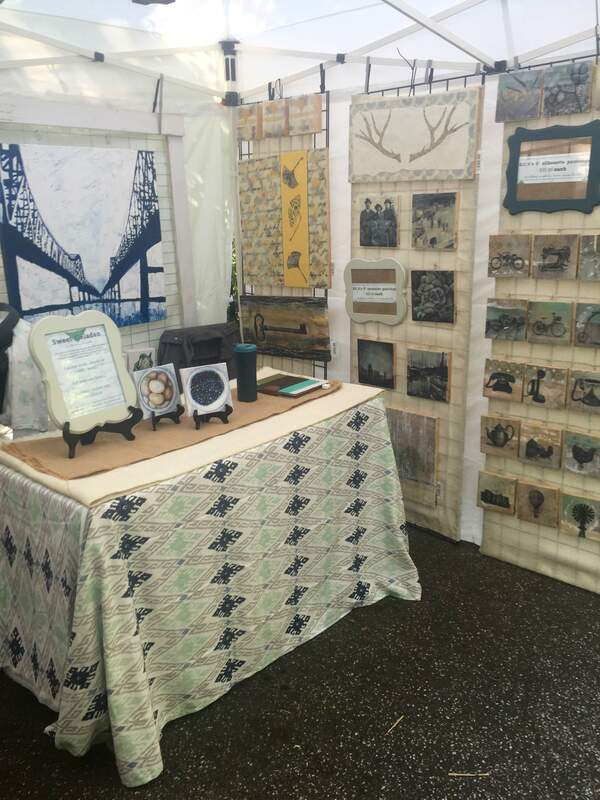 When I first set up my booth to take pictures I realized my encaustics could melt if it was warm enough outside and they were in direct sunlight. I began to panic. After all I had just invested a lot of money for my set up. What would I do if I couldn’t display my product outside? While teaching an idea hit me. 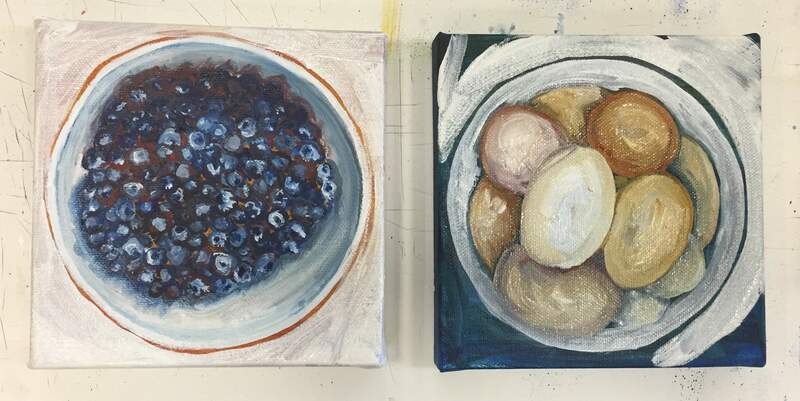 My students had just started oil paint studies of food. I was itching to paint with oils on canvas again and started my own so I could work along with my kids. I loved getting back to the basics of just paint and I was pleased with the way my bell pepper and pomegranate turned out. I wanted to do more. After thinking about it I decided these would be the perfect solution to my encaustic melting problem. If I moved around my artwork based on where the sun was hitting I could keep my encaustic out of the sun by displaying my oils in the sun. Since my bell pepper and pomegranate studies I have completed blueberries, eggs, a cabbage, orange, cauliflower, garlic, mussel, oyster, and I am finishing up a kiwi, tomato, onion, and papaya. 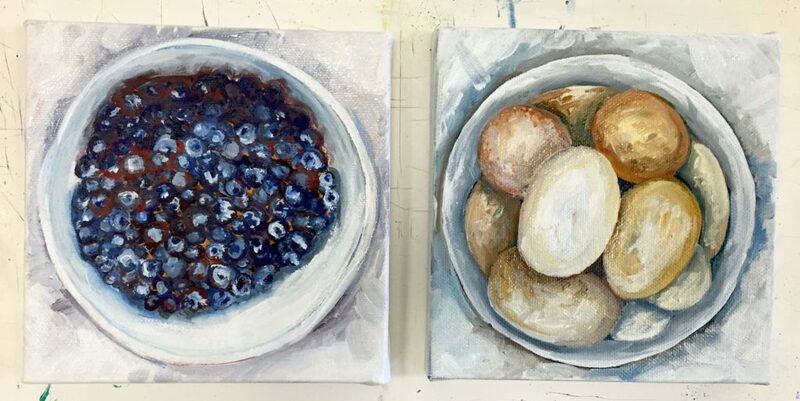 Each of these food studies are 6″x6.” I start with an underpainting, typically choosing the complementary color of the food I am painting for the background. 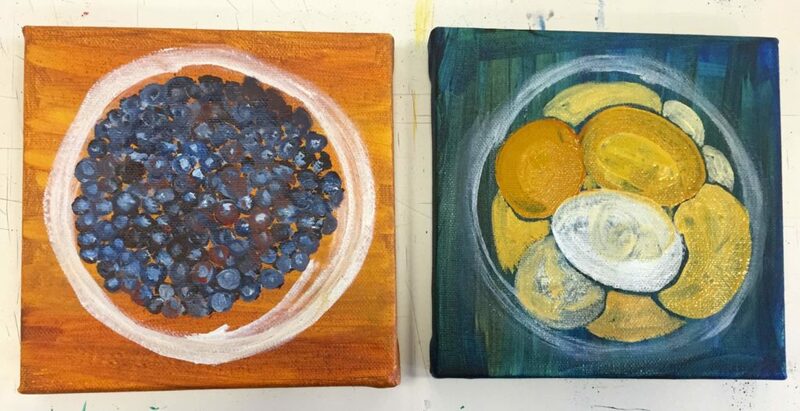 After allowing the underpainting to dry I mark out the shape of the food and add some detail before applying my first layer of white to the background. I like to leave hints of the underpainting peeking through. Whether it’s along the edge of a bowl or in between eggs, I think it adds another interesting detail to the piece. I also pushed myself to loosen up my painting style by trying out palette knife painting. I started with portraits of my chickens Rachel, Thackary Binx, Sir Sylvia, and Linda. I loved the texture and the sense of movement the palette knife marks made. 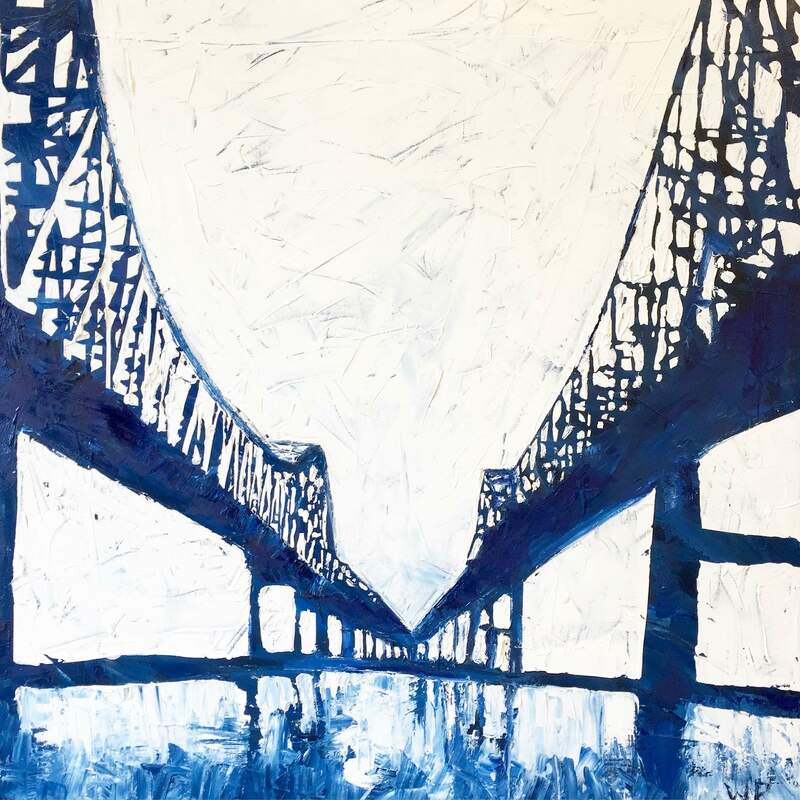 I decided to go even bigger than the 12×12 chicken portraits and I completed a 32″x32″ positive/negative space painting of the Crescent City Connection bridge in New Orleans. I will post additional information about my upcoming festival, Old Fourth Ward Park Arts Festival, next week.